My journey to study Yoshinkan Aikido has been less conventional than most. I started Aikido when I was 19, at this time I studied Ki Aikido (Ki Federation of Great Britain) and remained studying that style of Aikido until 2007 when I moved to a ‘traditional’ Aikido group (that have since affiliated to the Aikikai). It was during this time that I was able to meet Mustard Shihan in 2009 at a course in Dartford, set up by my (now) teacher, Sensei Neil Saunders of the Meikyokai dojo. It was at that course that I decided to fully commit to studying Yoshinkan Aikido. I read about Mustard Shihan in a book called Angry White Pyjamas right at the start of my Aikido career, and now 16 years later I get to be part of his organisation, frankly I cannot believe how lucky I am to be in this position. It is a real privilege. In addition to studying Yoshinkan Aikido I have studied Muso Shinden Ryu Iaido and Shinto Muso Ryu Jodo, it is my hope to return to these fine budo in the future. Our dojo is part the Shobukai association of Yoshinkan dojos headed by Neil Saunders sensei. Neil Saunders sensei started training at the Renzu Kwai Aikido Club under Andy Stiggear (6th Dan BAA) and Pam Hornsby (4th Dan BAA) as well as several other high grades of the Renzu Kwai. He holds the rank of 4th Dan in Tomiki Aikido through the British Aikido Association. Neil has authored two books on Aikido called Aikido – The Tomiki Way and Tomiki Aikido as well as a DVD called Tomiki Aikido – Koryu Dai San. He was fortunate to meet and train with David Rubens (7th Dan Yoshinkan Aikido), and continues to this day to train with Rubens Sensei when possible. Rubens Sensei has had a profound effect on his Aikido and this can be seen today. Through David, Neil met Robert Mustard (8th Dan Yoshinkan Aikido) and he has been able to train with Mustard Sensei on numerous occasions including several trips to his Dojo in Vancouver. Like Rubens Sensei, Mustard Sensei has had a profound effect on Neil’s Aikido. In September 2017, Neil was awarded the rank of 6th Dan in Yoshinkan Aikido by Robert Mustard Shihan. 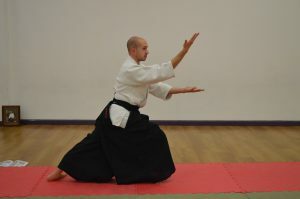 Robert Mustard Shihan is the technical director of our Shobukai association. Robert Mustard Sensei began his Yoshinkan Aikido training under Takeshi Kimeda Sensei (9th Dan) over 30 years ago. After achieving the level of sandan (3rd degree black belt), he left Toronto to continue his study at the Yoshinkan Aikido Honbu Dojo (headquarters) in Tokyo. In 1987, Mustard completed the intense 9-month “Senshusei” training course which is mandatory training for the Tokyo Riot Police and Honbu Dojo instructors. As a direct result of his determination and focus in this gruelling training, he was among the first foreigners ever to receive the award for best performance at the annual All-Japan Yoshinkan Demonstration. For close to 10 years he trained as a student of Soke Gozo Shioda, founder of Yoshinkan Aikido, Takafumi Takeno Sensei, 9th Dan; and Tsutomu Chida Sensei, 8th Dan. In 1991 Mustard Sensei was appointed Itaku Shidoin by Shioda Kancho and remained the Chief Foreign Instructor at the Yoshinkan Honbu Dojo until he moved back to Canada in 1995. Today he is recognized worldwide as being among the very best Yoshinkan Aikido practitioners and instructors. When he isn’t conducting clinics at Aikido dojos all over the world he is instructing classes in his own dojo located in Burnaby, B.C. Canada.